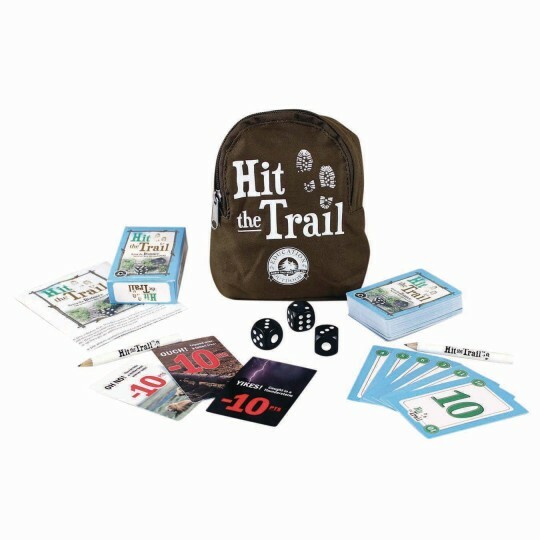 Compete to be the first hiker to hike 100 miles in the new dice/card game "Hit the Trail." Packaged in mini backpack which includes 72 cards, 3 dice, 2 pencils and rules. Compete to be the first hiker to hike 100 miles in the new dice/card game "Hit the Trail." Comes packaged in a mini backpack which includes 72 cards, 3 dice, 2 pencils and rules. Great product to play with grandkids! We picked up three of them so that they are available whenever we visit any of the kids.